Tanzania the scent of safari. How would you like the chance to witness one of nature’s greatest spectacles? The mass migration of some of the best known animals on the planet crosses the plains of Tanzania each year, making this an amazing safari holiday destination. A holiday above the rest in your own treehouse! If the idea of a safari strikes you as roughing it, worry not Tanzania boasts some of the best luxury safaris on the market. You get to see herds of giraffe, impala, buffalo and elephant from the comfort of a Land Cruiser as they make the 2000 mile trek across the national park. Guides and drivers are with you every mile so you are in safe hands and have expert knowledge on tap to make the most of your safari adventure. If the safari itself is enough of an extraordinary experience then why not stay in some of the most extraordinary lodges? 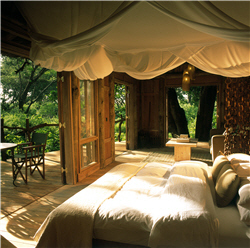 Recently we visited a couple of superb lodges in Tanzania. Firstly we stayed at the Lake Manyara Tree Lodge . Here you can stay in one of ten tree lodges that sit on stills! They are incredible and have a great decked viewing area. We also had out own Maasai warrior on hand to dissuade any overly curious and dangerous wildlife! We then stayed at the Grumeti Serengeti Tented Camp. If you have bad memories of camping as a child, prepare to be very impressed. This amazing tented camp is so different from the damp plastic contraptions of childhood you will be speachless with joy. It is nothing like anything else you have ever seen. For a start each tent contains a simply massive bed and an en suite bathroom! You can embrace the raw nature of safari, while enjoying a little civilized comfort. It was the safari of a lifetime. Would you like some expert travel advice for your safari holiday? Our travel team is passionate about Tanzania safaris and will help you find the best offers on the market.